There were several things that drew me to Laura Andersen's book The Boleyn King. First and foremost I love reading about historical figures, especially when it is about Royalty. I cut my teeth on books written by Jean Plaidy, Norah Lofts, and the like and recently moved on to some of the greats like Sharon Kl Penman, C. W. Gortner and Elizabeth Chadwick. Like many readers in this category, I have read numerous books about the Tudors, both fiction and non-fiction. 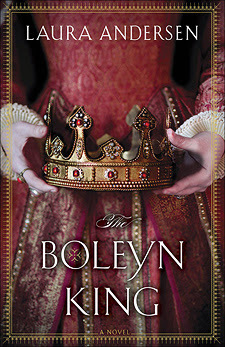 As a result, a book that poses the question..."What if Anne Boleyn had given birth to a son who lived, and who eventually grew up to be King" certainly caught my interest. I think that most of us who have read extensively about the Tudor Dynasty have wondered just that same thing at one time or another. In the first book of her Boleyn King trilogy, Laura Andersen introduces us to William Tudor, son of Henry VIII and Anne Boleyn, younger brother or Elizabeth, and the newly crowned King Henry IX of England. As William's 18th birthday approaches, he is preparing to take over the running of the kingdom from his Uncle George Boleyn, who has been serving as Regent and head of William's government. Add to this the usual political intrigue that always seems to surround the Tudor court, or most Royal courts for that matter, a mystery that needs solving, wars that need attending to, and a love triangle and you have all of the elements of a top notch story. In spite of it's obvious departure from the facts, I am happy to say that the overall representation of the people and events in this story is true to the nature of the times. She certainly did her homework, and her depiction of such historical figures such as Anne Boleyn, Elizabeth Tudor, Mary Tudor, George Boleyn, and others such as the Percys and Robert Dudley, are spot on. Her ability to stay true to their natures while including just the right amount of embellishment was fantastic. In fact, she did such a good job with her portrayal of Elizabeth that she, rather than William, became my favorite character in the book. Another place where the author was perfectly on the mark was in the way she depicted the Tudor Court. Here again we see her research manifest itself in the inclusion of political intrigues and court machinations that were so prevalent at the time. Here again, she did a masterful job of blending the truth with a fiction in such a way that the end result came off as totally believable. In fact,she did such a good job here that even my reading friends that are sticklers for truth in historical fiction ended up liking the book. as for me, I was transported to the court of Henry IX, and did not want to leave. As I said above, this is the first book of a trilogy, the second of which is being released today . I, for one, am certainly excited as I did not want this book to end when it did. It was one of those books where I just wanted a few more pages, a bit more time with the characters. If you are a fan of historical fiction, royal courts, the Tudors, and especially Elizabeth I, I would strongly recommend reading this book. It will be a thoroughly enjoyable experience.